Langston Galloway of the New York Knicks after hitting a 3-pointer in the second half of Monday’s game against the Atlanta Hawks. The New York Knicks did something unusual Monday night: They won a basketball game — just their 17th this season. What wasn’t so unusual — from a franchise that starred in such tragicomedies as Amar’e Stoudemire punching a fire extinguisher and Andrea Bargnani nearly snatching defeat from the jaws of victory — was the Knicks’ poor sense of timing. Having spent most of the season ridding their roster of anyone who could possibly help them win, the Knicks have now won twice in a row. Those two wins could make a lot of difference to the Knicks’ chance of drafting Jahlil Okafor or Karl-Anthony Towns. With one game left for each team, the Knicks are 17-64, a game better than the Minnesota Timberwolves at 16-65. The Philadelphia 76ers have the third-worst record at 18-63. Let’s say each team loses its final game. Under the NBA’s lottery formula, the Timberwolves would have a 25.0 percent chance of landing the first pick, the Knicks would have a 19.9 percent shot, and the Sixers a 15.6 percent chance. There’s a better way to award those pingpong balls, one that maintains the spirit of the current lottery system without allowing a one-game difference to matter so much. That might seem arbitrary — but it produces results that are remarkably similar to the current formula, only fairer. What chance would each team have at the first pick this year, for example? 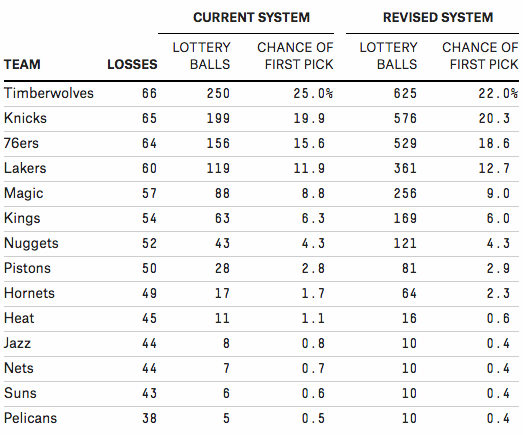 Assuming each team’s final game goes according to the FiveThirtyEight NBA Power Ratings,3 that would leave the Wolves with a 22.0 percent chance at the first pick, the Knicks at 20.3 percent and the Sixers at 18.6 percent. That’s more proportionate to the small difference separating Minnesota, New York and Philly in the standings. Here’s how the lottery balls would have been distributed in each of the past 10 seasons.4 On average, the worst team would have had about a 25 percent chance of winding up with the top pick, as it does now. But those chances would have been as high as 38.5 percent (for the record-setting 2012 Charlotte Bobcats) or as low as 19.0 percent (for the 2013 Orlando Magic), depending on how much separated the very worst team from the almost-as-bad ones. 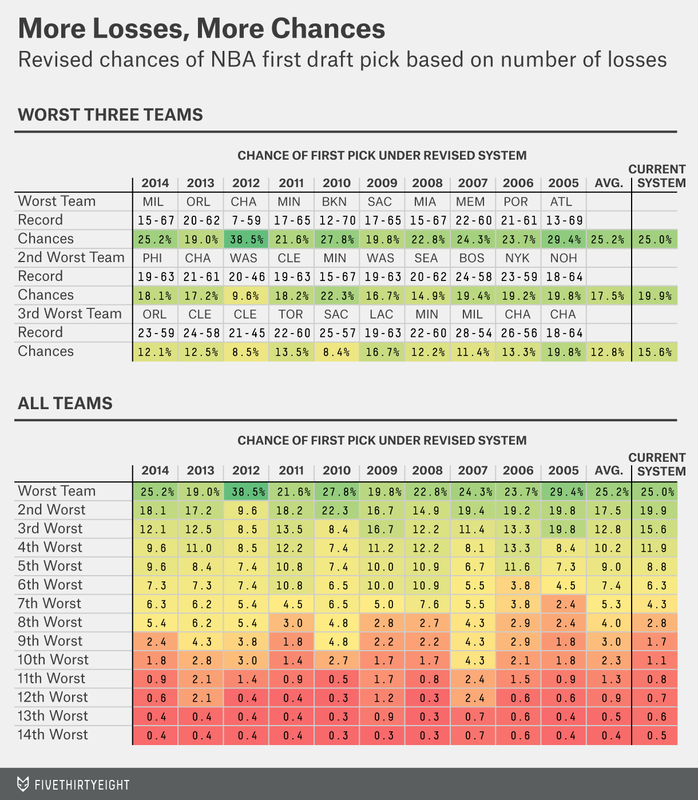 In a year like 2010, in which there was a big gap between the second-worst team (the 15-67 Timberwolves) and the third-worst (the 25-57 Sacramento Kings), that’s where the sharpest break in lottery chances would have been. It’s not the radical change that I’d prefer! But it’s a simple enough reform that even the Knicks couldn’t screw it up. CORRECTION (April 15, 3:36 p.m.): An earlier version of the chart in this post gave the incorrect location of the second-worst NBA team in 2005. At that time, the Hornets were located in New Orleans, not Charlotte. The league does, at least, split the difference in the event of ties, so if the Knicks and Timberwolves each finish at 17-65, they’ll each have about a 22.5 percent chance at the first pick. Otherwise, a team with a winning record would get more lottery balls than a team with a 41-41 record, since subtracting 41 from a number less than 41 and squaring the result would produce a positive number. Meaning that the Wolves, Knicks and Sixers all lose. For 2012, which was shortened by a labor dispute, I’ve prorated loss totals to an 82-game schedule.